Yeesh. 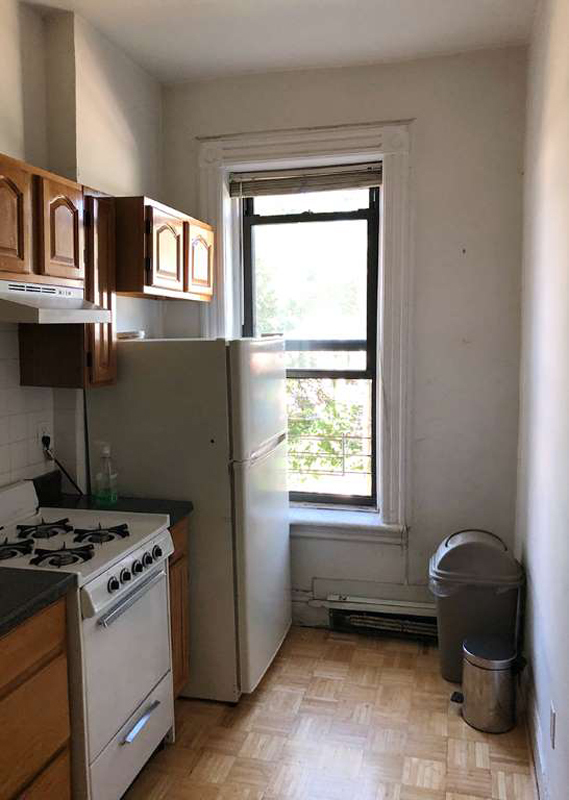 As you can see, there was a lot wrong with this space: The clunky, room-shrinking maple cabinets, the icky linoleum counters, the general lack of storage space, the fridge in front of the only window. (Why???) I had my work cut out for me. With tiny dimensions and no room in the budget to pull a Joanna Gaines and knock down walls, I knew we needed as much storage as humanly possible. 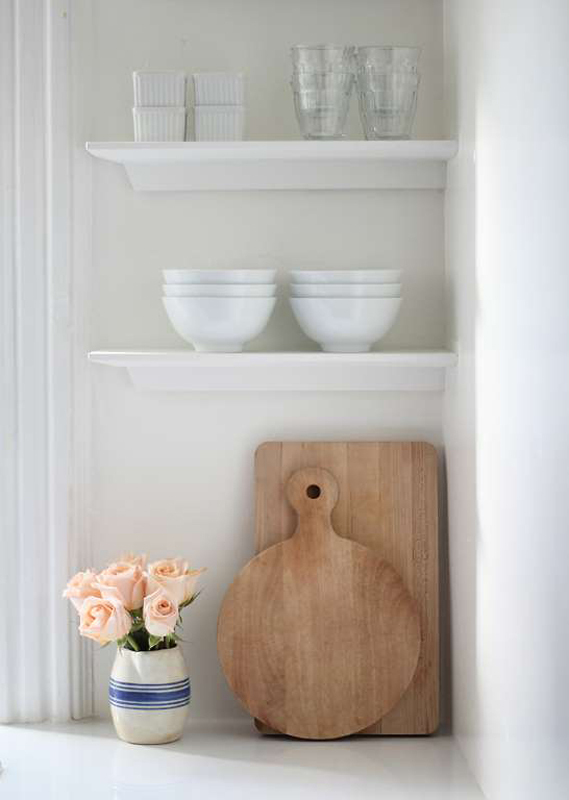 Read: Custom, ceiling-high cabinets, an open shelving feature and new lowers to create an L shape. 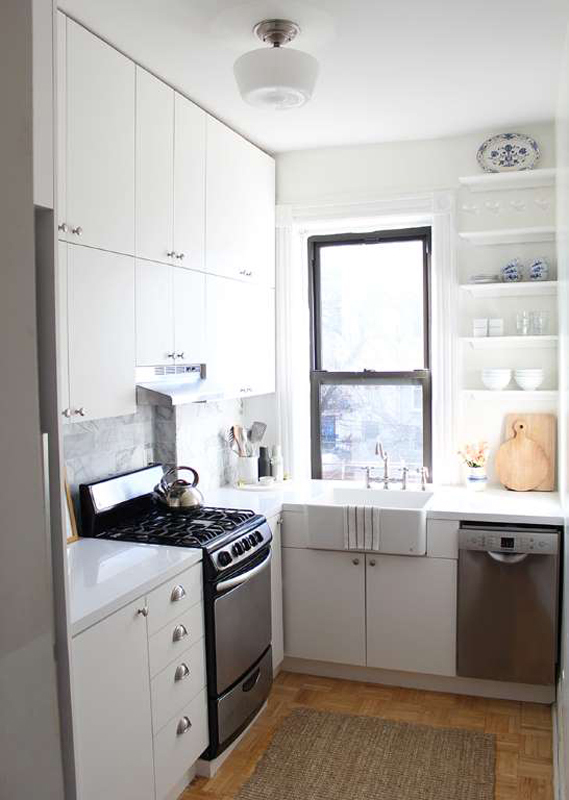 To complicate matters, the apartment is pre-war and has wavy original plaster walls—which necessitated extra on-site fitting and trimming work. 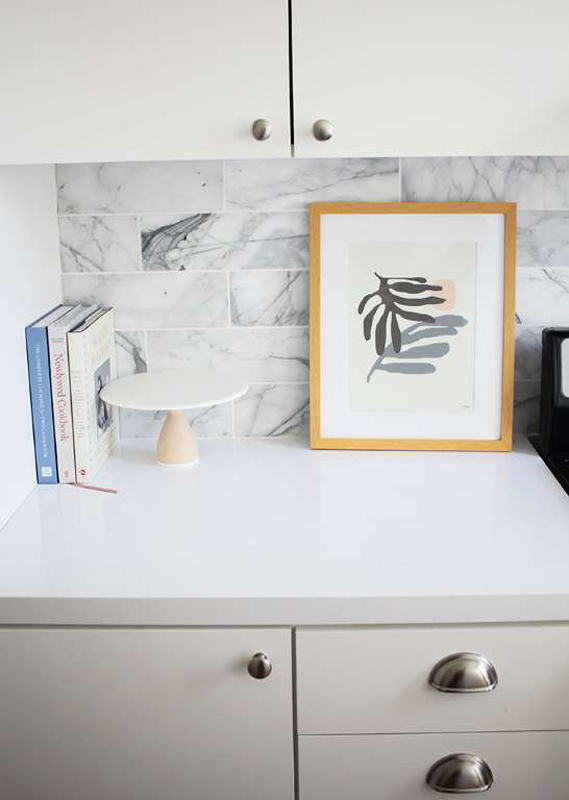 I chose simple, flat-face door fronts and worked with a family friend as my builder to keep costs down, but cabinets are like mattresses—good ones are a super-important investment and they’re gonna cost ya. 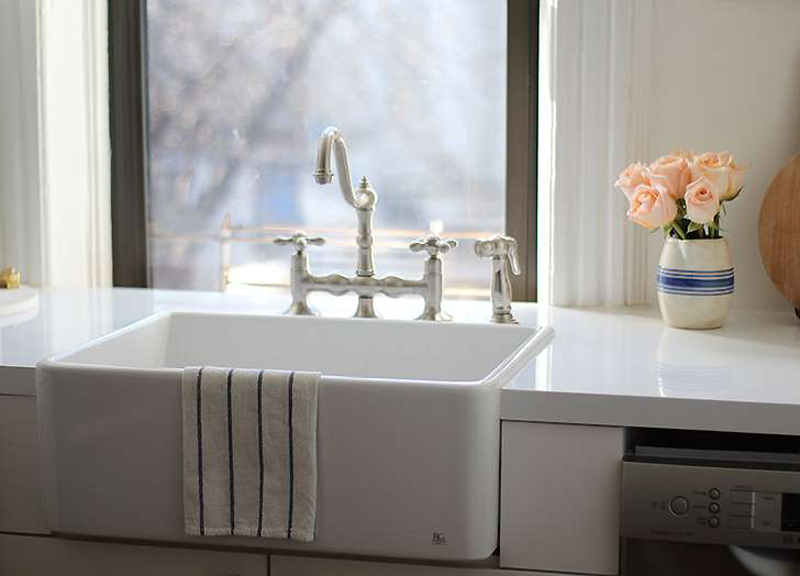 For my countertops, I wanted something bright, white and airy that I wouldn’t have to worry about from a care perspective. The obvious choice? Quartz. My builder had a relationship with a local stone yard and was able to get a glossy white quartz slab expedited. 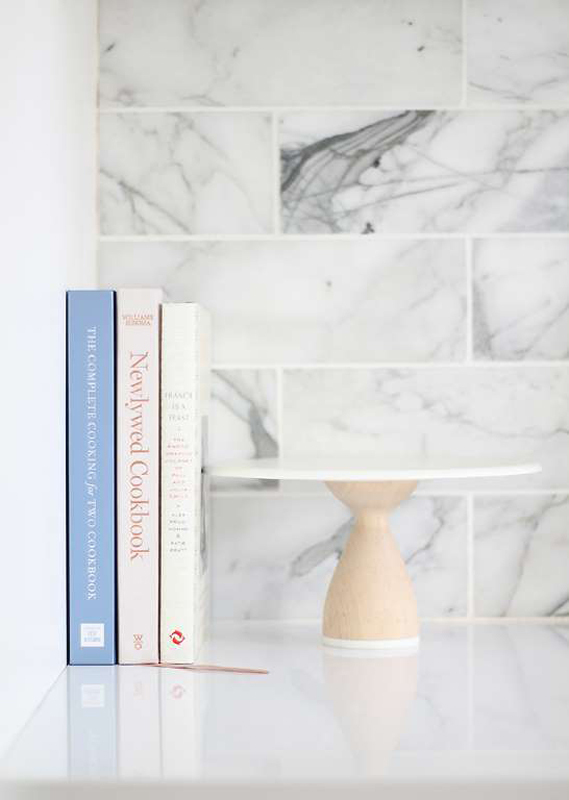 I had always associated quartz with being a somewhat budget-friendly counter choice—so I was pretty shocked by our $2,600 tab. 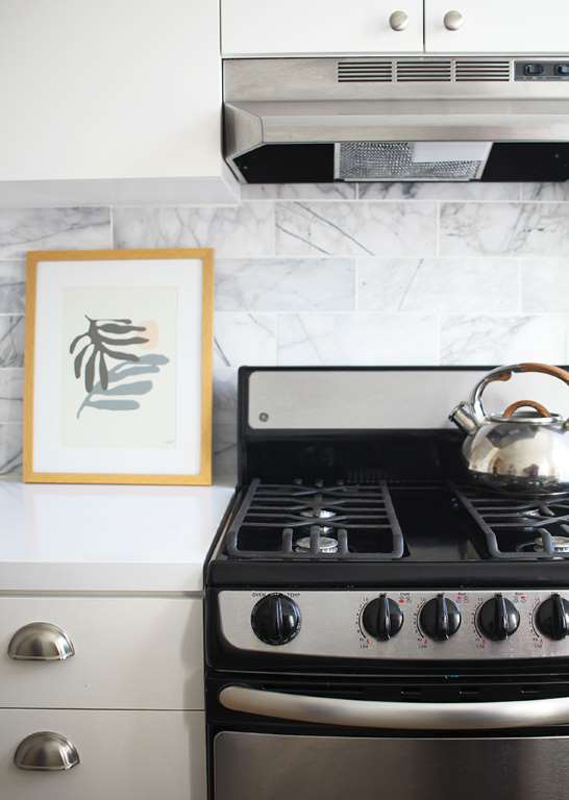 While I wanted to go with easy-upkeep, man-made material on the countertops for utility reasons (hi, constant wear-and-tear), classic Carrara marble is my dream kitchen material. So I brought in some of that luxe natural texture via the less-abused backsplash instead. The kitchen features a shallow wall cutout in the back corner, which was imperative for storage—but super awkward-looking. 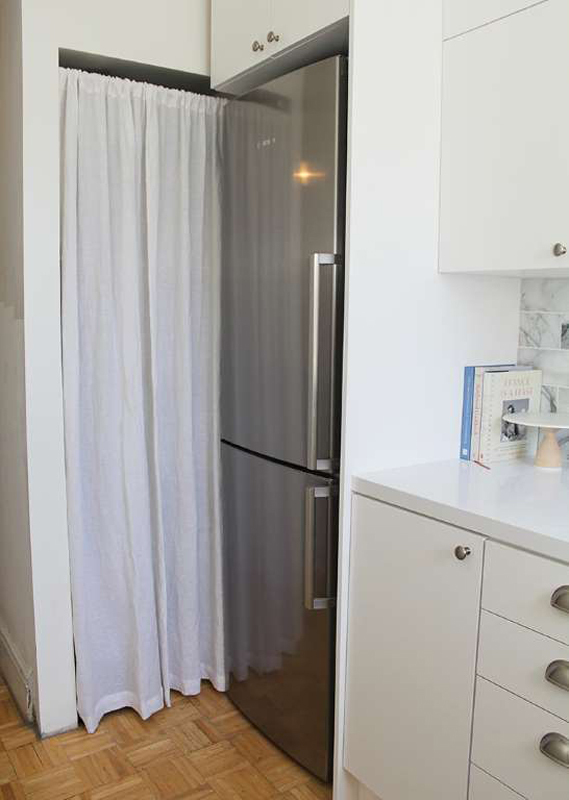 Originally we noodled on installing a custom pull-out pantry, but to save money, I had my builder add some interior cubbies and hooks, and then I hung a simple linen bistro curtain—which encloses cleaning supplies, bulk items and various hardware odds and ends. I know, I know—mixed metals are the order of the hour. But I really wanted a classic space, and I didn’t feel like the small footprint could stomach too much experimentation. I streamlined the room and tied in the appliances with these classic satin nickel knobs and pulls. (Not-so) fun fact: Mini appliances are way more expensive than larger, standardized models. 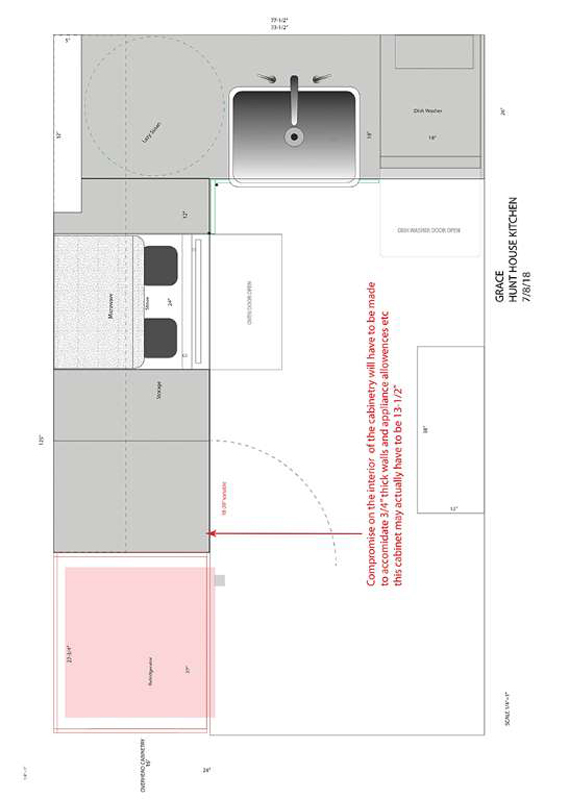 I had to quadruple my appliances estimate to account for a built-in 24-inch fridge, a mini 18-inch dishwasher and a 24-inch stove and blower. We had originally wanted to install an over-range microwave, but they were a rarity and crazy-expensive. Who knew? My best advice? Work with someone you trust. Open, comfortable dialogue with your builder is key to getting what you want in the long run. Also, keep it classic. 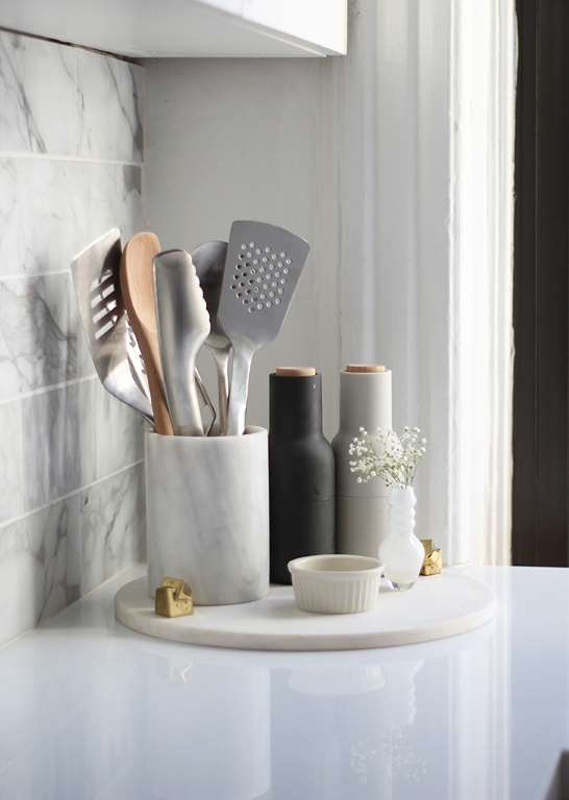 There are so many options when it comes to kitchen design, but by staying simple and timeless, I didn’t get overwhelmed by choice, I kept on schedule and I expect that my design will look current for decades to come. Lastly, double your budget. Honestly, nothing is perfect when it comes to construction and all those little adjustments and extra hours will add up more than you can imagine.